One of the most significant changes Parisian loos seem to have undergone since the 1960’s (and indeed, probably in the last decade) is that they are mostly free. At least I only encountered one 0.80€ (in a lovely 19th century building in the gardens) in my wanderings. Why this is I am not sure, but it would be interesting to investigate! I didn’t get to many of Routh's recommendations, but made a point of paying a call at a couple of note. 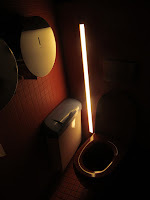 "Here I think, and by a strange coincidence English in style and origin, are some of the best loos in Paris. Downstairs off the Dive Bar they are also the only ones in Paris marked simply, and intelligibly, ‘Ladies’, and ‘Gentlemen’. 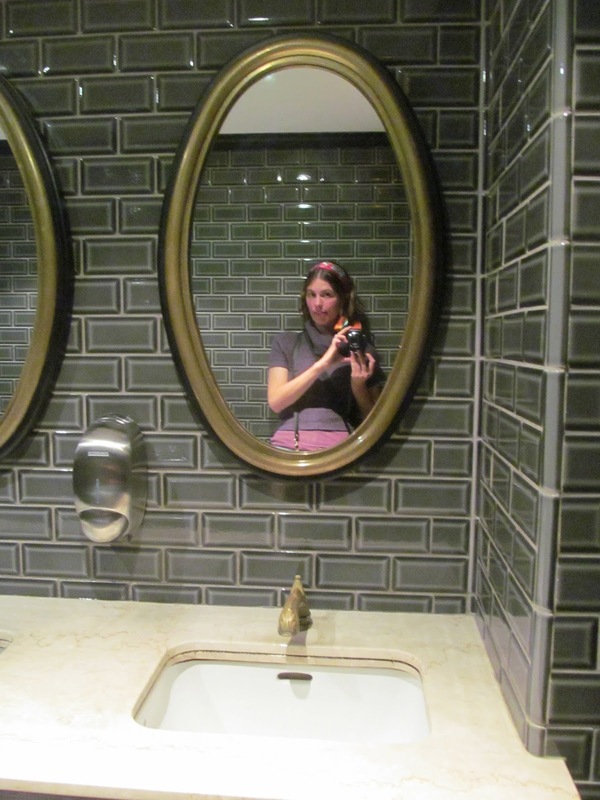 "I give absolutely full marks to this place for having had the foresight, the imagination and the money to design such loos that are so in keeping with the character of the establishment they grace – or, more truthfully, that is an appendage of them. Just as the pub is a Hollywood film version of an Olde Englishe Pubbe – everyone eating ‘Le Bangers and Mash’, ornate Victorian cut-glass mirroir signs inscribed with calumnies like ‘Porridge and Scotch’, so the style of the loos is Victorian-whimsy. 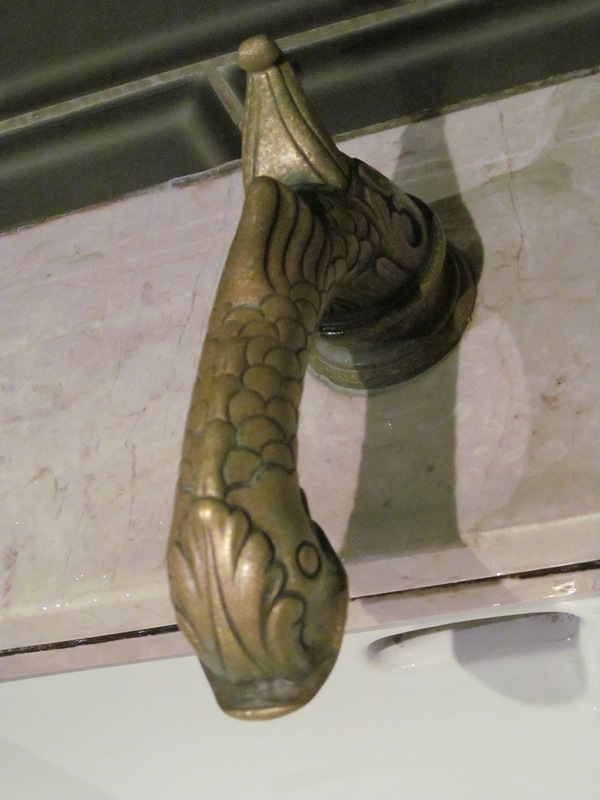 "In the Gents, green tiles of damask design, Victorian mirrors and brass lamps, basins of black marble set in a rich mahogany cabinet with phallic soap fitting and splendid gargoyle fish tap (do not, as I did, break a nail by trying to screw or unscrew the fish’s head or tail, or even any part of its anatomy to work it; water gushes from it as your hands enter the basin ­– induced by electronic beam set in the basin’s side: all very Jules Vernish) and splendid read Turkish toweling. 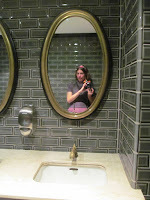 Normal loos, but the urinoirs, flanking the basin, are fitted with red velvet arm rests: so as far as I am concerned the ultimate luxury for the toileteer. "In the Ladies a similar array of richness. 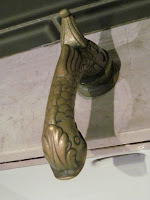 Green marble basins, great oval mirrors, brass door handles to the loos themselves in the shape of feathers. 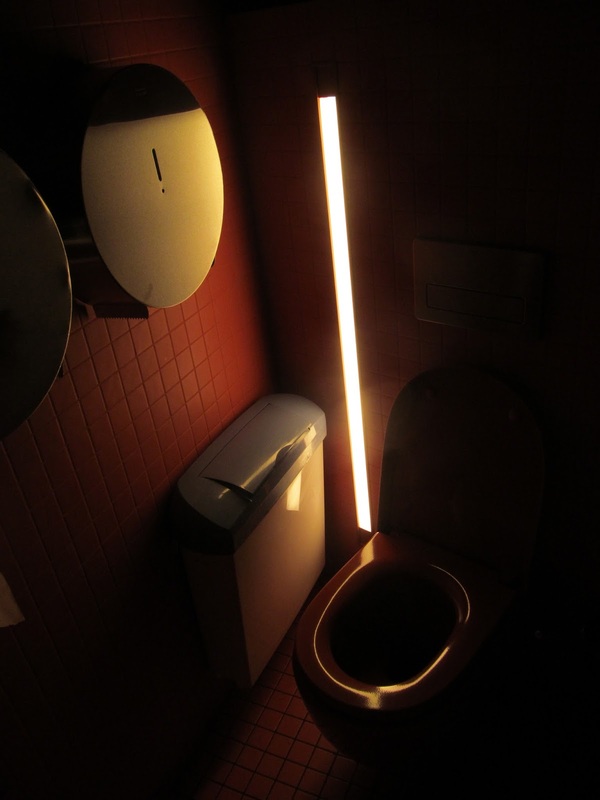 "These loos, open 8 a.m. to 3 a.m., are an absolute must for the keen toileteer." The loos are almost exactly as advertised, except that the red Turkish towels have been replaced by a Dyson hand dryer. On first exploration the splendid gargoyle fish taps didn’t so much gush as drizzle for a brief moment, and then ceased to work altogether. My gentleman companion later informed me (after asking one of the staff) that there is a foot-operated button on the floor, which I must have fortuitously stood upon. So all my subsequent gesticulations in an attempt to make it get the soap off my hands were for naught. There is also a rather sweet pub cat. "For the toileteer this building is of little interest. Indeed I would council the male toileteer who finds himself in its vicinity to travel no further than the fine pissoir in the gardens below the tower; and his female companion to have attended her business at some loo of note elsewhere beforehand. "However, though hardly deserving of an entry in this book, I would be shirking from my duty were I not to give some brief notes on the building’s appointments. There are loos on each étage. Those on the Première are utterly unmemorable. At the main ones on the Deuxième there is a lady who is most anxious that you should patronise her toilets and cold water basins. She will tell you if you ask her that she does not know if there are other facilities in the tower. To use her toilet and basin it will cost you 0.20F and a further 0.10F if you borrow her bar of soap. I think for fear that you may slip it into your pocket and make off with it she watches every second that you put it to use. She also I suspect keeps the hot tap. At any rate, there's a hole for it on the basin, though I dread to think how much she might charge for its hire. "Also on the Deuxième Ètage, if you are alarmed at this lady's attentions , you will find a loo attached to the Salon de Thé. Its merit is that it is unattended. "It is on the Troisième Ètage that we discover the most ridiculous feature concerning loos in the eiffel tower. However fantastic a feat of engineering it may have been to construct a loo 898 feet above ground level, and even though the first person to use it may have been King Edward VII at its inauguration in 1889, it seems absolutely mad and ridiculous that this loo, which could have the finest view of any in Europe, has frosted glass in its square port-hole of a window; and therefore no view at all. (Also it's closed from November to March.) After spending forty minutes making the ascent to it imagine my feelings on discovering this. So I do earnestly beseech the authorities, if they do not wish to have a falling-off in their trade with toileteers, to remedy this travesty. "The loo itself is very tiny, two toilets and one basin. But a very nice lady in charge who greets and bids farewell to her clients. "How sad to relate that this building, one of the most famous in Europe, should have such disappointing loos. Someone has told me of a notice near the top which says, 'it is forbidden to relieve yourself over the side.' I would add that in a high wind it is also extremely unwise." For toileteers making the sojourn today, I would advise going early in the journey. The loos of the Première Ètage are clean and pleasant. And very red. The sinks for both ladies and gents are open plan with nice views. There is also a small lounge area with instructions not to picnic. These may well be the former free loos to which Routh referred, as they were directly above the café. The loos of the deuxième étage had much more of a queue, and so I didn't end up going in. They are very blue, and have welcoming messages in a huge number of languages. The yellow loos at the top have a disappointing lack of view, and are small and smelly. Two stalls for women, and you have to battle your way past a cleaning lady going in and a hoard of foreign toileteers going out. Let's return to a moment to that statement about the "feat of engineering" required to build a toilet 898 feet above the ground. Since there's very little enclosed space to hide pipes in the tower they must be pretty subtle... we did spot them, though had no way to tell which ones corresponded to what. My attempts to find out more about the engineering behind them have so far been futile, though I did discover that there is a record-holder for the tallest Eiffel Tower made of toilet roll. With 250 million visitors since its opening it must have carried a fair load! The other highlight of the day was at the opposite extreme, down in the sewers of Paris. But that is a story for another day.